SINGAPORE - The number of dengue cases reported last week rose slightly to 218, latest figures from the National Environment Agency's (NEA) dengue website showed. This was 38 cases more than the previous week, which had fallen below the 200-mark for the first time in 2016. Another 44 cases were reported from Sunday (May 15) to 3.30pm on Monday. What is the risk of dengue at nature areas compared to residential areas? A total of 7,765 cases of the mosquito-borne virus have been reported this year. 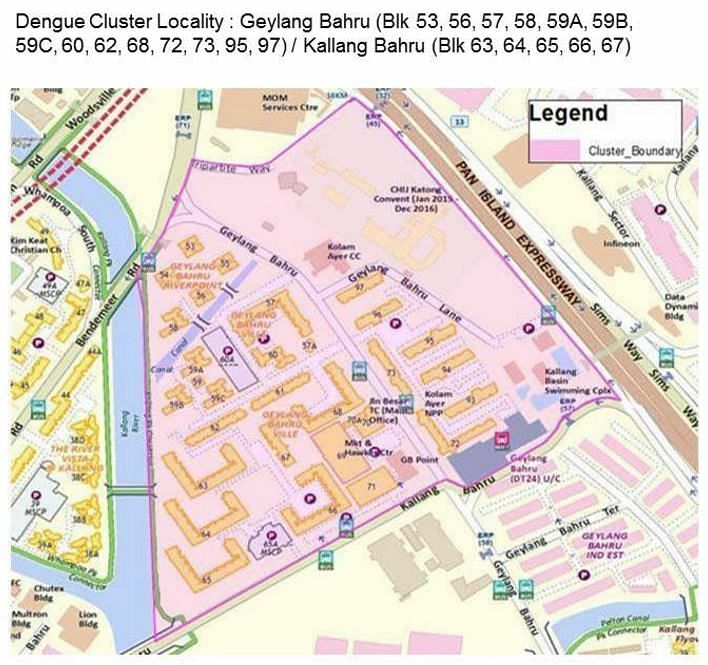 As of Monday, there are four high-risk dengue clusters in Singapore - a significant drop compared to the 10 reported last week. A HDB estate in Geylang Bahru was the highest risk area with 86 cases. The NEA has continually stressed that the eradication of mosquito breeding habitats and the spraying of insecticides to control the adult mosquito population remains the key to dengue prevention. "We need to keep up with these efforts as we strive towards mitigating the forecast surge in cases in the coming months," it added. While weekly figures have generally been on the downward trend in recent weeks, dengue cases had previously been predicted to reach a record 30,000 this year. Four people have also died from dengue this year, matching the number seen in the whole of 2015. The latest death on March 22 was that of a 73-year-old woman who lived at Poh Huat Road West. Last Friday, Singapore's first case of the Zika virus was detected. A 48-year-old man living in Bukit Timah's Watten Estate had tested positive after returning from a business trip to Sao Paulo in Brazil. Both the Zika and dengue viruses are spread by the Aedes aegypti mosquito. The news prompted a concerted effort to curb the mosquito population in the estate, which was not a high-risk dengue cluster. In its latest update, the NEA said it had inspected around 700 premises since last Friday, and detected and destroyed 40 mosquito-breeding sites as of Sunday.